While Marriott’s three loyalty programs were mostly combined last August, there are still some major changes coming this year, particularly in the next month. Marriott’s loyalty program will be rebranded as Marriott Bonvoy as of February 13, 2019. Not a whole lot will be changing overnight, but rather they’re just rebranding the program, since up until now the program has still operated under three names (Marriott Rewards, Ritz-Carlton Rewards, and Starwood Preferred Guest). With these changes we’ll also see Platinum Premier rebranded as Titanium, and we’ll see Platinum Premier with Ambassador rebranded as Ambassador. We know a much more substantial change will be happening to Marriott award redemptions as of March 2019. 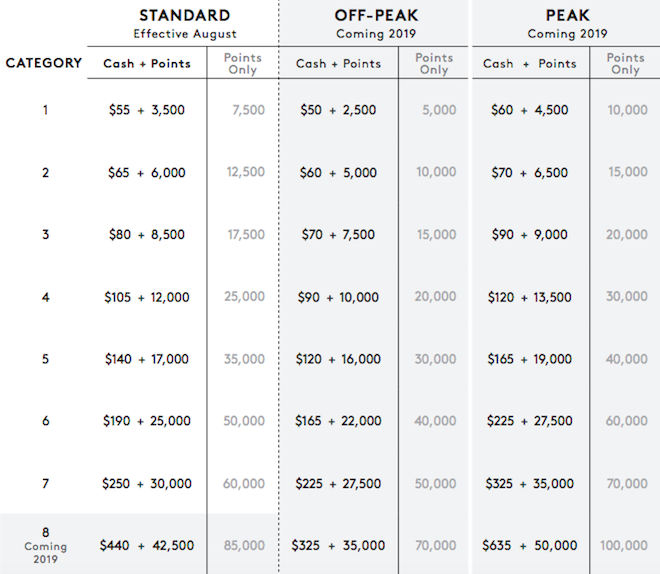 Starting then, Marriott will introduce Category 8 award pricing, while currently properties are capped at Category 7. Initially Marriott was also supposed to introduce peak and off-peak pricing then, but it looks like that has been delayed, which is good news. For example, currently the most expensive Marriott properties cost 60,000 points per night. Once Category 8 is introduced, properties will cost up to 85,000 points per night. Then when peak pricing is introduced, properties will cost up to 100,000 points per night. So the savings of booking before then are potentially significant. Every year Marriott also has award category adjustments. Essentially Marriott changes which hotels are in which categories, in order to reflect market conditions. In theory these categories are decided based on the cost Marriott incurs from redemptions there, which reflects both the average daily room rates and average occupancy. Marriott has just released their full list of category changes for 2019, which kick in for bookings made as of March 5, 2019. So you still have time to make bookings before then at the old rates, even if you’re staying after the changes kick in (this is all about when you book and not about when you stay). In total about 380 hotels will be changing categories (a bit over 5% of Marriott’s global portfolio), and of those fewer than 40 hotels will be decreasing in cost, and more than 340 hotels will be increasing in cost. The overall percentage of hotels changing categories is smaller than in the past five years. Only 5 percent of the entire Marriott International portfolio are affected by the annual category changes process. Of all participating hotels, 1 percent are decreasing, and 4 percent are increasing in point cost with 95 percent remaining unchanged. Fewer hotels are moving up this year than in the past – over the past 5 years between 10 – 15 percent of the portfolio went up a category. Ninety-one percent of all hotels require between 7,500 – 35,000 points per night. As a reminder, cardholders of Marriott Rewards® Premier Plus Credit Card (soon to become the Marriott Bonvoy Boundless Credit Card on Feb 28) or the Starwood Preferred Guest® Credit Card from American Express (soon to become Marriott Bonvoy American Express Card on February 13) receive one free night award worth up to 35,000 points every year after their account anniversary. Cardholders of Starwood Preferred Guest® American Express Luxury Card (soon to become Marriott Bonvoy Brilliant™ American Express® Card on Feb 13) receive one free night award worth up to 50,000 points every year after their account anniversary, which is redeemable at ninety-seven percent of the Marriott International portfolio. Members can save up to 25K points per night by redeeming points for one of the 62 luxury properties in Category 7 that are slated to move to Category 8 on March 5. Note that their bullet points exclude the properties that are increasing to Category 8, so excluding those 62 hotels really doesn’t paint a very fair picture. These changes are rough, especially when you look at the number of properties increasing vs. decreasing. Ultimately we knew this was coming so it’s not unexpected, but when you combine the category changes with the introduction of Category 8 pricing, a lot of properties will be a lot more expensive. On the plus side, it sounds like peak and off-peak pricing will only be introduced later in 2019, which is good news.